Spherulites are multilamellar vesicles obtained by moderate shearing of a lamellar phase of lipids and surfactants. They consist of concentric bilayers of amphiphiles alternating with layers of aqueous medium, in which hydrophilic drugs can be sequestered with high yield. Both small and macromolecules can be loaded into spherulites with high efficiency (Figure 1). Spherulites differ from liposomes (artificial lipid bilayer vesicles) in that liposomes typically have fewer layers, are usually comprised of phospholipids and are generally smaller than 400nm. 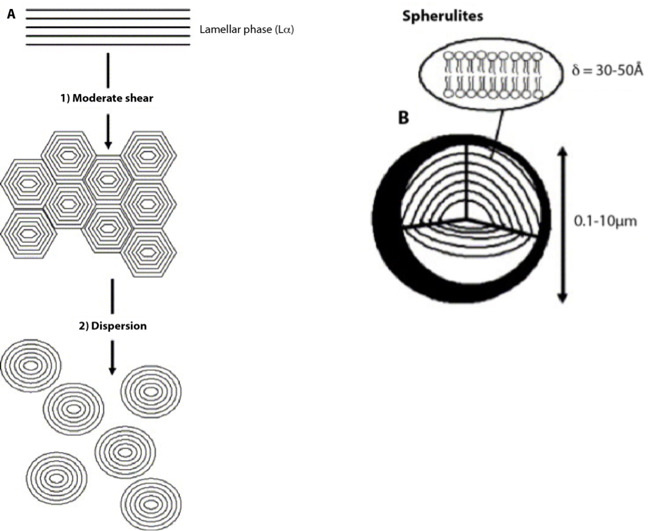 Figure 1: Preparation of a dispersed spherultic sytem B from the lipid lamellar phase A.
Spherulites can be comprised of non-charged lipids and are generally larger and more stable. The anisotropic ordered membranes in spherulites may be visualised by cross-polarisation microscopy (Figure 2). Figure 2: Cross polarisation microscopy. The terms "structured system"; "structured surfactant system"; and "structured suspending system", all describe a composition comprising water, surfactant and any structurants required to impart suspending properties to the surfactant. 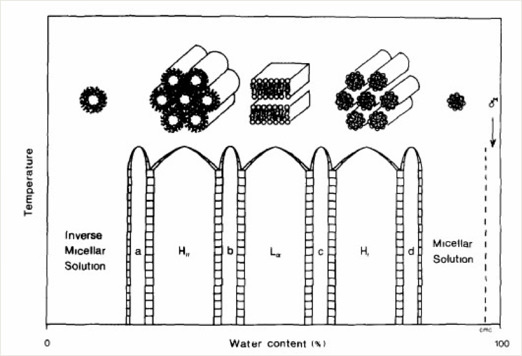 These components together form a mesophase, or a dispersion of a mesophase (state of matter intermediate between liquid and solid) in a continuous aqueous medium, which has the ability to suspend non-colloidal, sparingly water soluble particles, while the system is at rest, and without sedimentation. One advantage of spherulite formulations, is the minimal risk of denaturation of macromolecule cargoes, due to the low-shearing force applied during encapsulation. In addition, the suspended media may be added after the formation of the structured suspension. Preparation of spherulites in this way also avoids exposure of cargoes to organic solvent, which further minimises damage - for example in the case of protein cargoes. Finally, the resulting unique multi-layer structure, may provide a controlled-release mechanism, that could be useful for achieving prolonged drug action. The biophysical properties of drug-loaded spherulites are affected by many factors such as lipid composition, shear force, and the type of cargoes to be loaded. However, more research is required to understand the multitude of factors contributing to an optimal spherulite preparation for small and macromolecules of different drug classes and therapeutic intents. Structured suspending systems depend on the rheological properties of the suspending medium to immobilise particles, irrespective of size. This requires the suspending medium to exhibit a yield point, which is higher than the sedimenting or creaming force exerted by the suspended particles, but low enough to enable the medium to flow under externally imposed stresses, such as pouring and stirring - like a normal liquid. The yield stress is the minimum applied stress to make a fluid flow. Below the yield stress, the system will deform elastically. After flowing, the structure reforms sufficiently rapidly to prevent sedimentation, once the agitation caused by the external stress has ceased. The only structured systems sufficiently effective to find widespread application, have been based on aqueous surfactant mesophases. Structured surfactants generally comprise an Lα-phase, in which bilayers of surfactant are disposed with the hydrophobic "tail groups" of the surfactant on the inside and the hydrophilic "head groups" on the outside of the bilayer. The bilayers lie in a parallel or concentric arrangement, usually alternating with layers of an aqueous medium. Lα-phases are also referred to as G-phases. They are commonly characterised by the textures observed under the polarising microscope and/or by small angle X-ray diffraction, which usually shows peaks indicative of lamellar symmetry. Although most cell membranes in vivo exist in the fluid Lα phase, the gel (solid) phase of lipid bilayers, where the lipids are free to diffuse, has biological interest for specialized membranes such as the stratum corneum. See Figure 3. Structured suspending systems typically comprise dispersed lamellar, spherulitic and/or expanded lamellar phases. Dispersed lamellar phases are two phase systems, in which domains of a lamellar phase are dispersed in, or interspersed with, an aqueous phase to form a gel. Figure 3: From: Seddon, J. M. (1990). "Structure of the inverted hexagonal (HII) phase, and non-lamellar phase transitions of lipids." Biochimica et Biophysica Acta (BBA) - Reviews on Biomembranes 1031(1): 1-69. 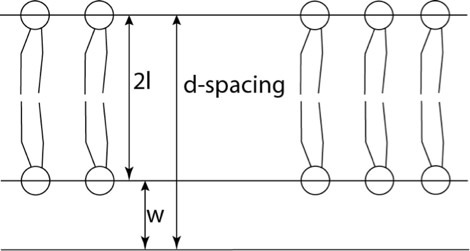 An alternative structured system is the expanded Lα-phase, which is a single phase having a wider d-spacing than conventional Lα-phase. See Figure 4. Conventional Lα- phases, contain 60 to 75% by weight surfactant and have a d-spacing of 4 to 7 nanometers. Attempts to suspend solids in such phases result in stiff pastes which are either non-pourable, unstable or both. Expanded Lα-phases have a d-spacing greater than 8, e.g. 10 to 100 nm. They may be prepared by adding electrolyte to aqueous surfactants at concentrations below those required to form a normal Lα-phase. The amphiphilic nature of surfactants, promotes self-association in aqueous environments and facilitates the formation of micelles above a critical concentration. Most structured surfactants require the presence of a structurant, as well as surfactant and water in order to form systems capable of suspending solids. The term "structurant" is used here to describe any non-surfactant capable, when dissolved in water, of interacting with surfactant to form or enhance (e.g. increase the yield point of) a structured system. It is typically a surfactant-desolubiliser, e.g. an electrolyte. However, certain relatively hydrophobic surfactants such as isopropylamine alkyl benzene sulphonate are self-structuring, and can suspend solids in the absence of any structurant. Figure 4: Lipid layer dimension terminology. l is the lipid length, W is the thickness of the water layer between membranes. The d-spacing is 2l + W.